Artificial Intelligence (AI) technology is advancing by leaps and bounds, enabling unprecedented opportunities of growth and optimization within the energy. Complete the form below to download the white paper! 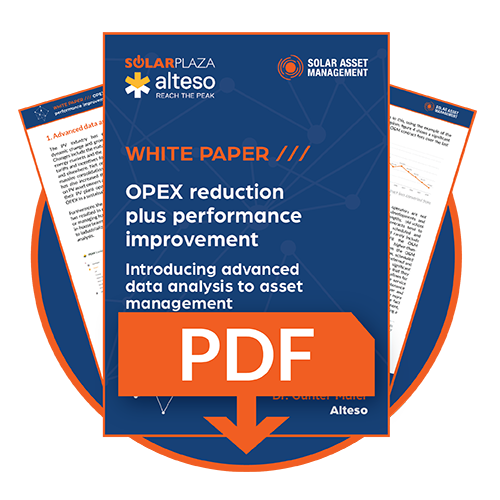 This comprehensive white paper elaborates on the subject of advanced data analysis in combination with the current key asset management component of operations and maintenance (O&M), specifically highlighting the delicacies surrounding operating expenses (OPEX). Furthermore, this paper attempts to shake up the current thinking around the operation and management of PV assets, and offer solutions for a way forward, appropriate for the times. The PV industry has experienced both dynamic change and growth in recent years. Changes include the maturation of renewable energy markets and the expiration of feed-in tariffs and incentives for PV plants in Europe and elsewhere. Not only has this initiated a massive consolidation of the industry, but it has also increased the commercial pressure on PV asset owners and managers to optimize their PV plant operations and reduce their OPEX in a sustainable manner. Furthermore, the consolidation of the industry has resulted in numerous companies owning or managing hundreds of PV plants with slim in-house teams and, therefore, a very real need to industrialize their PV plant supervision and analysis. To serve this purpose, providers of advanced data analysis are increasing in number and vary in type and scale. 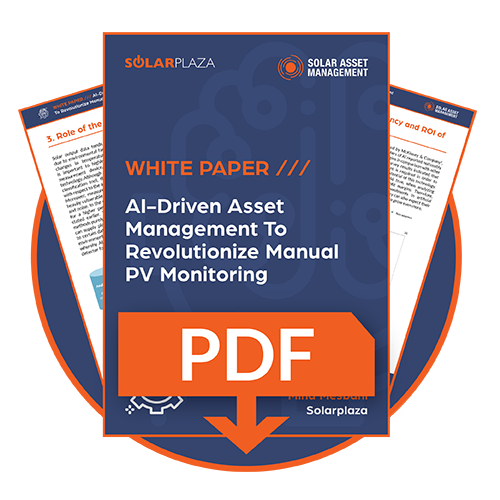 Despite this established offering, the concept of advanced data analysis is still relatively new and has experienced a slow integration into the traditional PV asset management structure. Don't bite the dust! Having a clear understanding of the technical and financial impact of soiling is imperative when choosing the right strategy to monitor and overcome it. This complimentary white paper provides key definitions of the phenomenon; explains the measurement of soiling; and highlights both existing & experimental solutions for battling the dirt. Many elements determine the optimum output of a PV module, one of which is the concept of soiling. Soiling occurs as a result of dirt, dust and other particles covering the surface of the PV modules. Dust composition widely varies across the globe, which affects both the type and amount of soiling. There are a number of methods to quantify and monitor soiling. These include conventional pairing of PV reference cells, as well as smarter methods, such as advanced data analysis. It is imperative to measure soiling for operational PV plants as well as pre-construction site surveys, since soiling can anticipate future performance. To eliminate the effects of soiling, panels require cleaning, which can be carried out utilizing either wet or dry solutions. The cleaning methods fall into the three main categories of manual, mechanised-manual and robotic cleaning (subdivided into automated or semi-automated). Although soiling cannot be prevented, its negative effects can be mitigated by means of deploying dust-repellent agents and coatings. This complimentary white paper explores the rise of European corporate PPAs, key considerations for developers & corporate buyers as well as the trajectory of the path forward. The European solar PV market is projected to grow twofold in annual deployments between 2016 to 2020 according to an analysis published by SolarPower Europe. Using innovative financing schemes and business models is therefore crucial to promote investor confidence, given the capital-sensitivity of renewables and specifically solar. One of the main solar business models is self consumption, in which the consumer owns the PV system enabling them to reduce electricity costs and sell the surplus back to the grid. The second main business model is the Power Purchase Agreement (PPA), which entails a contract between the PV owner and the consumer to sell them a specific amount of energy at a set price for a fixed duration. Less common models include the Virtual Power Plant (VPP) and cooperative model. All in all, the European solar PV industry has weathered some major transformations in the recent years in addition to market parity and the increase in demand for solar energy across the continent. These transformations are primarily linked to regulatory shifts and policy changes. This has resulted in significant changes in solar business models, leading to a need for innovative solutions designed to address this additional complexity. 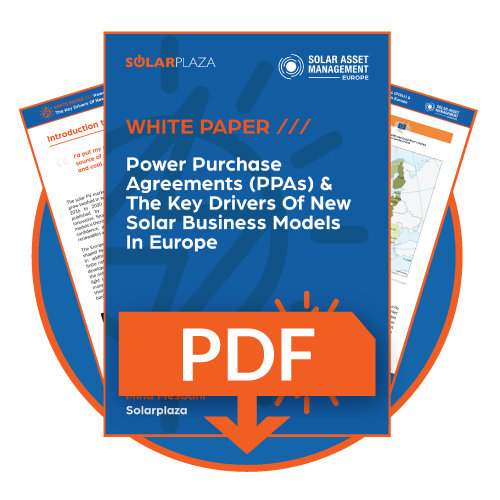 Power Purchase Agreements (PPAs) have and will continue to play a crucial role in enabling such solutions in the European photovoltaic market. 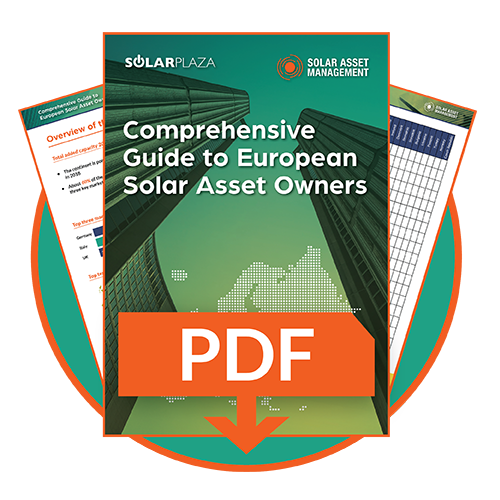 To take better stock of the solar ownership across the continent, we have compiled this comprehensive list of European solar asset owners. Europe has experienced an uptick in annual solar PV installations over the course of last year. According to SolarPower Europe, European PV installments grew by 28%, to 8.61 GW in 2017. The region is poised to install an average of 14 GW every year till 2022 and approximately 11GW by the end of 2018. Furthermore, the European solar market is at the cusp of a new cycle, no longer bolstered by feed-in tariffs. This new post-subsidy era has encouraged a healthy investor appetite for new bankable solar business models. Another consistent theme has been the ever-changing landscape of European PV ownership and secondary PV market consolidation amongst major European solar markets. Complete the form below to download the guide!